30 lenses per box @ $22.69 per box. Minimum order 6 boxes (three months' supply). 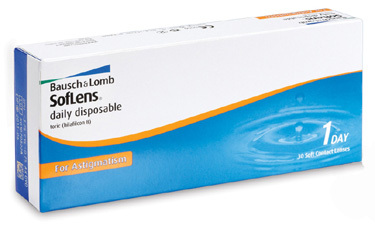 The Soflens Daily Disposable for Astigmatism is the first daily toric lens designed to reduce spherical aberrations (natural distortion) and provide excellent vision even in low light, plus Bausch & Lomb's ComfortMoist technology helps the lens to attract moisture and works with the eye to develop sustained wetness (and with it comfort), even after 10 hours of wear.